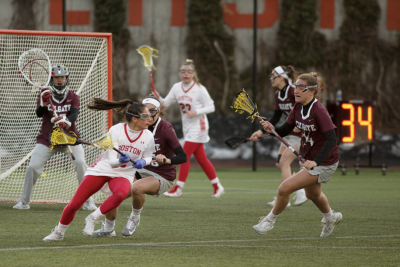 With a three-goal performance from freshman attack Hannah Kenneally, the Boston University women’s lacrosse team narrowly beat the University of New Hampshire by a score of 12-10 in Durham, New Hampshire, Tuesday afternoon. Kenneally’s hat trick ties her for third place for most goals scored for the Terriers (9-4, 4-1 Patriot League) this season. 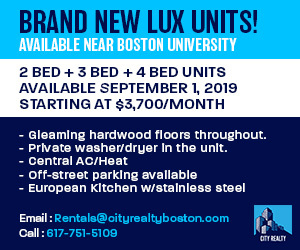 The New York native scored the last goal of the game Tuesday, allowing the Terriers to secure a win with a two-goal cushion. To start the game, Wildcat midfielder Rylee Leonard received draw control over the ball. Before one minute of play was able to elapse, she put UNH (8-5, 3-1 America East) on the board first. For the next four minutes, BU was unable to get a shot on goal. It took until around the six-minute mark for the Terriers to put a shot on frame, which went past Wildcat goaltender Issy Torres. It was senior midfielder Kaitlin Belval’s team-leading 25th goal of the season and tied the game at one apiece. UNH claimed the lead back within three minutes, with midfielder Julia Neyland checking in her sixth goal on the season for the Wildcats. Four more minutes into the period, the Wildcats collected two more goals — one free-position goal from Blanding and one goal from attack Mickenzie Larivee — to distance themselves from the Terriers with a three-goal lead. At this point, the Terriers turned their play around, going on a 5-0 run through nearly the rest of the first half to jump forward to a 6-4 lead. Kenneally picked up two goals in the run, and sophomore attack Ava Barry, sophomore midfielder Emily Vervlied and senior midfielder Kelly Matthews each picked up one. Larivee scored again for the Wildcats to cut BU’s lead to one before the first half ended, and the Terriers headed into the locker room up 6-5. Both BU and UNH showed equal signs of dominance through the first half. The Wildcats had a narrow 14-12 lead in shots, and the teams were tied at 11 apiece in shots on goal. Morton said her team managed to settle in after UNH put on offensive pressure. “I think that we weren’t doing a great job initially on the draws and the ground balls, but once we understood what we needed to do offensively and defensively, that’s where we started to see some of the success,” she said. A few minutes into the second half, UNH had tied the game back up off a goal from midfielder Devan Miller. As the second half went on, temperatures began to drop below freezing, and a snowstorm formed in the sky over Wildcat Stadium in Durham. “It started hailing and snowing at the game, and a lot was thrown at us,” Morton said. This did not stop the Terriers from taking back the lead. With the game knotted up at 7-7, junior attack Kailey Conry and freshman midfielder Maddie MacMaster each tallied goals, MacMaster’s in free position, within a minute and a half of each other to bring BU to a 9-7 lead. Less than a minute later, junior midfielder Makenzie Irvine scored off an assist from Barry to increase the Terriers’ lead to 10-7. UNH fired back just over a minute later off a free position goal from Miller, but within 30 seconds, BU’s Vervlied had tucked in her second goal of the night to bring BU back up by three. UNH would not give up after this quick response, though, clawing back with two goals in two minutes to bring the score to 11-10 BU with just under six minutes left to play. As the evening came to a close, the Terriers would not let the Wildcats tie things up. BU would finish the game with a more comfortable two-goal lead off a final effort from Kenneally at the 2:34 mark. The final score from New Hampshire would be 12-10 in favor of the Terriers. Morton said she believed her team was able to contribute when necessary to maintain their lead over UNH. BU’s next test will come this Saturday away at Patriot League opponent Bucknell University. The Bison (4-9, 2-3 PL) have lost their last two games, which came against conference foes the College of the Holy Cross (4-8, 2-3 PL) and Colgate University (5-7, 3-2 PL). The Terriers have four games left this season, all against Patriot League opponents. Morton said she told her team before they went home Tuesday night they need to play their best down this final stretch of league matches.